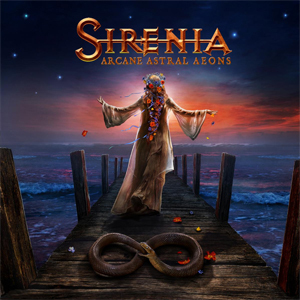 SIRENIA Launch Official Video For "Into The Night"
The Nordic Epic Metal masters SIRENIA recently released the second single "Into The Night" from the new album Arcane Astral Aeons, which will be out on October 26 via Napalm Records. Now they follow up with the gloomy and dark official music video for the new single. Watch the new video on KNAC.COM HERE! "We hope you guys enjoyed our second single "Into the Night". We are happy to release the official video clip for this song today. Soon we will be back on the road performing material from our new album Arcane Astral Aeons. We will start in St Petersburg, Russia on the 26th of October, then Moscow on the 28th, after Russia we will do the first leg of our European tour and the Masters of Rock winter edition in Czech Republic. Looking forward to seeing you all there. Feel free to drop by our website for full tour dates." "We are very proud of what we have achieved together and we're very eager to share it with you, hoping that you all will find it as special as we do", mastermind Morten Veland states.